“Why did you pull the arrow out?” Emma demanded, unzipping her own jacket and pulling her sweater over her head. She had a tank top on under it. She patted his chest and side with the sweater, absorbing as much of the blood as she could. “Raziel,” Emma muttered. She’d mopped away as much of the blood as she could. It was still welling from the puncture wound, running in thin streams down his stomach, gathering in the lines between his abdominal muscles. “I hope they put that on my tombstone.” He gasped as she shifted forward, and she realized abruptly that she was squarely in Julian’s lap, her knees around his hips. It was a bizarrely intimate position. I agree with Emma, pancakes are much better than coffee! I hope Jules will be okay. Lady Midnight is released on March which is also the first date of Cassie’s US tour. No, Jules can’t be hurt! I hope he’s okay. Seeing this, when she muttered “Raziel” I thought at first we were about to see what would happen if a Shadowhunter named one of their seraph blades after him! Lol wouldn’t that be cool? Actually, according to the Codex it isn’t a good idea to name a seraph blade Raziel. Wasn’t Emma wearing white tank top? 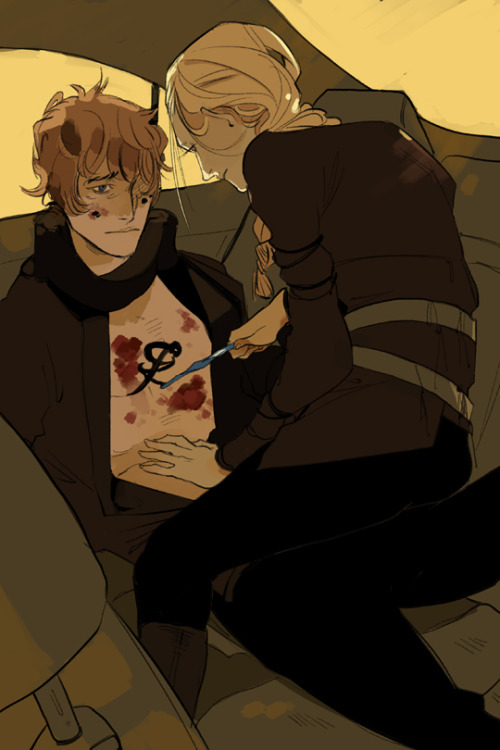 She had taken off her sweater to dab at Jules’ wounds.